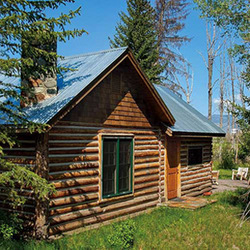 A beautifully furnished and fully equipped 1,300 square foot historically restored log cabin, with large private outdoor patio. The Living/Dining Room is beautifully furnished and cozy, and includes a stone fireplace. A crackling fire, good book, or good friends (or all of the above) will only make this room more comfortable than it already is. The dining area includes an antique hutch and dining table with seating for 4. A rustic armoire holds a TV/VCR for those who need to stay in touch with that far away world. .The cabin has a washer and dryer located in the utility room off the main bathroom. The outdoor patio includes a historic outdoor brick fireplace. Hiking, mountain biking, fishing, and all that the Absaroka-Beartooth Mountains and surrounding mountain ranges have to offer is nearby. Numerous Forest Service trailheads providing direct access to high mountain lakes and magnificent mountain peaks in the Absaroka-Beartooth Wilderness are available a few miles up the Mill Creek Road. A fishing access to the famous Yellowstone River is about 3 miles from the cabin, and fishing can be accomplished either on your own or through the many outfitters available in Livingston. Of course the Madison, Gallatin, Bighorn, and other popular rivers are within a day trip away. Yellowstone National Park is about 35 minutes from the cabin, and is a must see. Horseback riding is also available through outfitters in the area. Don't rule out a winter visit either as the area provides excellent cross-country skiing opportunities. Chico Hot Springs (a historic natural hot spring) is about 6 miles to the south, and offers a magnicient restaurant, a western bar (with the occasional dance), and of course swimming. Directions: Mill Creek Cabin is south from Livingston about 15 miles, and located at the mouth of Mill Creek Canyon.